SANWILD WILDLIFE SANCTUARY is situated in the Limpopo Province in South Africa. SanWild rescue injured, orphaned, traumatized or misplaced wildlife and provides a safe sanctuary for these animals for the remainder of their life in the form of a protected wildlife reserve. SanWild’s objectives are a combination of acquiring habitat and saving individual wild animals in need of help. All land acquired through their fundraising efforts will fall under the auspices of the SanWild Wildlife Trust and will thus be protected in perpetuity. Their goal is to establish a 15 000 hectare sanctuary and their vision is to ultimately incorporate adjoining farmlands to form an ecologically viable wildlife reserve to protect a unique wilderness area. SanWild currently have nearly 20 lions in their care that were saved from canned hunting. Canned hunting is a situation where animals, and in this case lions, are raised in captivity for the so-called “sport” of shooting them in an enclosed area. Fortunately the lions were saved, but sadly they will never be released into the wild because they have been fed by humans all of their lives, and have no natural hunting instincts. These magnificent animals are well cared for at SanWild; however, feeding and maintaining them is an extremely costly commitment, and one the sanctuary is constantly challenged to fulfill every day. 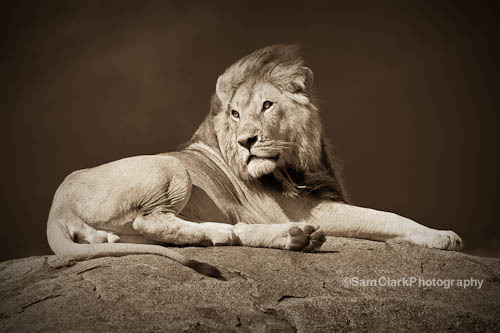 To help with some of these ongoing costs Sam Clark Photography is holding a raffle of a 16×24 inch fine art print of an African Lion taken on safari in 2010. For a small donation of $2 you can be in the draw to win this magnificent print, which has been printed on fine art Hahnemuhle Photo Rag Paper. It will be personally signed by myself and shipped to you anywhere in the world. You can enter as many times as you like, increasing your chances of winning while raising much needed funds for the Lions. 100% of the funds raised from this raffle will be donated to the SanWild Wildlife Trust, which will go directly into the feeding and care of these magnificent creatures. This is the print that will be raffled to help the SanWild Lions. Thank you from the SanWild Lions!